Good bye ’15, hello ’16! Happy New Year, friends and furries! 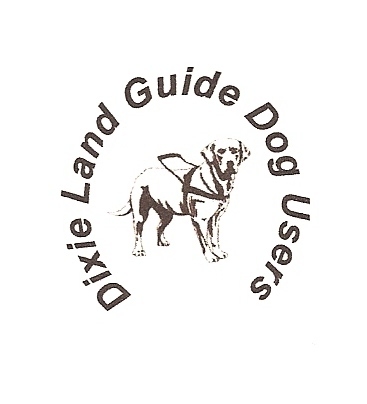 Dixie Land Guide Dog Users enjoyed a busy, yet productive 2015 and we're looking forward to an even busier, more productive 2016. Our Dixie Land Guide Team truly enjoys each opportunity we get to educate and enlighten both the blindness community and the sighted. We are thrilled to have been able to form a long-lasting relationship with the great girls of the Delta Gammas at the College of Charleston and are happy to oblige any time they ask us to come and speak with their members. Much has happened in the past year. We enjoyed visiting with over 150 two-legged and 90 four-legged friends at our now infamous Top Dog-Charleston, 2015. What a great time we all had! The only thing better than the food, workshops, entertainment and exhibits was the fellowship. If you were there, then you know what we mean. If not, well…hopefully you can make it to Top Dog-Orlando, 2017. We cannot look back upon the past year without remembering 2 of our special heroes-Lacey and Brego. Lacey, a beautiful black gold-a-dor from Foundation Guide Dog School was Brianna Murray's first guide. They were matched back in 2011 just prior to Brianna becoming a freshman at Winthrop University. Lacey did a great job leading Brianna to each of their classes over their 4 years together before showing obvious signs of retirement. Lacey's last official duty was to guide Brianna up to the front of the crowd to accept "their" diploma! Lacey is now living with her "Grandma & Grandpa" Murray in Charleston, enjoying the lap of luxurious retirement while Hopps, a strikingly beautiful black lab guides Brianna through grad school! Congratulations, Brie and Hopps! You can see pictures of them, and lots of others, on our Facebook page. Of course, we all remember Brego and what an ambassador he was for our mid-lands Dixie Lander, Ann Humphries. They began their journey together back in 2010 and worked side by side for 5 years. When Brego began to give subtle signs of needing to retire, Ann took notice and contacted her school. The trainers and staff at Southeastern Guide Dog School agreed it was time, so Ann returned to their Florida campus to get her successor guide, Monty. Monty has some big doggy shoes to fill, but we know he is up to the task! We're currently in the planning stages for this year's activities. We've already been asked to do some training for a nearby county and look forward to our newly formed relationship with the City of Charleston ADA representative, for whom we recently served as part of a small focus group. Of course, we are going to continue with our partnership in Christian Ministry and currently are busy trying to arrange various group activities and special appearances. If you'd like to know more about what we've done and where we've gone, simply click on the other posts on this site. Be sure to come back to our site more often! Meanwhile, we pray God's continued good blessings on you and yours. Remember, with God's divine guidance and that special pup by your side, you CAN do anything!